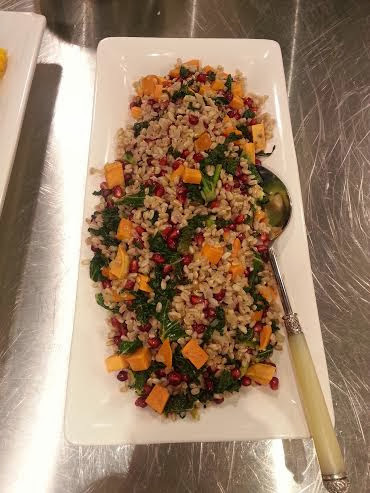 Last month I took a cooking class (crossing another thing off my 101 in 1001 list) at Sur La Table with Rachel from An Eventful Life and Monica from Caravan of Style.We had such a fun time creating tasty vegetarian dishes and this recipe for farro, kale and sweet potato salad with pomegranate seeds was a huge hit. Preheat oven to 375 degrees and position an oven rack in the center. To roast sweet potato: In a large bowl, combine 2 tablespoons oil with sweet potato, salt and pepper and toss until well combined. Transfer the mixture onto a rimmed baking sheet, spreading evenly. Place the baking sheet into the oven to roast, stirring every 15 minutes, until fork tender, about 3 minutes. To cook kale: In a large nonstick skillet, add the remaining oil and when shimmering, add the onion and cook until translucent, about 6 minutes. Add he garlic and cook until fragrant, about 60 seconds. Add the kale and cook until wilted, about 2 minutes. Add the lemon juice and transfer the kale to the bowl with farro and toss until well combined. Taste and season with salt and pepper. Looks delicious! I'll have to give it a try. Yum! This looks like the perfect weeknight dinner! Mmmmm this looks great! I tend to do a lot of quinoa, which I bet would work well here too. Definitely yummy flavors to combine.